North Webster Elementary School Parents Teachers Organization is sponsoring a Walk-A-Thon fundraiser for the second year in a row. Last year’s was such a success that it has become an annual tradition. The entire community is invited to join the PTO in trying to raise money to help defray costs at North Webster Elementary. The funds go to help with teacher extras, field trips, playground equipment and much more. In lieu of a traditional fundraiser, the PTO is walking and exercising the student body instead of selling items that no one really wants or needs. Each student will be given a pledge envelope on Friday, Sept. 14, and will be asked to solicit donations from friends and family members. If each student only collects $30, the PTO would raise almost as much as the $18,000 earned last year. Donations in 2011-2012 went to purchase a large piece of playground equipment on the fifth grade playground. If a similar amount is raised, no other fundraiser will be held by the PTO during this school year. 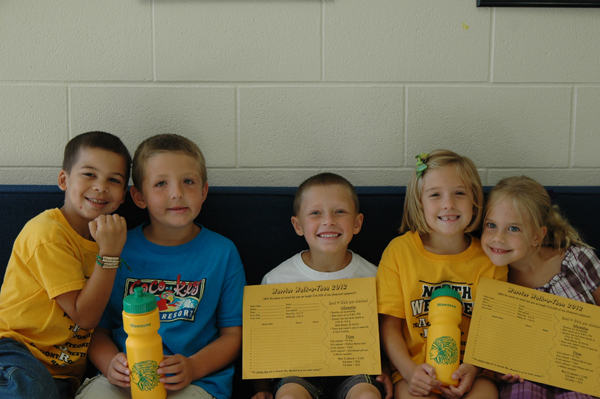 Each grade level will be walking at the Walk-A-Thon together throughout the school day on Friday, Sept. 28. Last year there was fun music and good cheer throughout the event. It all ends with a teacher race. The students line up around the track to cheer on the teachers. Several community businesses have already donated to help defray fundraiser costs. Ziebart, Ace Hardware of North Webster and the Lady Lionesss Club have all given and other businesses and organizations are encouraged to give as well as individuals. There will be numerous prizes available for students to win. Each student will receive a Warrior water bottle just for walking. If a student collects $50 he or she will get a MUDLOVE Warrior bracelet. Collecting $100 will get the student a Warrior T-shirt. Those who raise $250 will get to choose between a Warrior sweatshirt and a big box discount store gift card. All students who collect $30 will get to throw pies in the faces of selected teachers. The class that collects the most money will get to turn the principal, Kris Woodard, and the student services coordinator, Christie Holst, into ice cream sundaes at a pep rally. Last year this was a huge hit! The student who collects the most money will get $100 cash. Second-place winner gets $50 cash and third-place winner gets $25 cash. All contributions are due on Sept. 21. All donations are tax-deductible. Make checks payable to North Webster PTO, 5745 N. 750E, North Webster, IN 46555. Please write your student’s name on the memo line if you’re mailing a check. PTO officers for this school year are President Kristin Bonner, Vice President Kristen Firestone, Secretary Mindy Coblenta, Co-treasurers Kassy Klinefelter and Tisha Holsten and Advisor Gina Beckner.